Note: IE will actually catch this error and retry using SSLv3 so to the end-user it seems that IE works but it actually exhibits the same behavior. The first step is recognizing the error on our system so we can identify it when trying to reproduce it. First step is setting all the logging to “TRACE” for thewebmethodsserver logger. 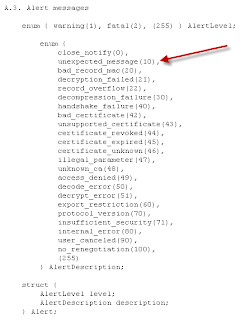 The server log/error log does not show any indication that the failed connection took place. Setting “javax.net.debug=all”(or ssl)in the server.bat actually results in no additional output whatsoever.This may point to a custom webmethods implementation for HTTPS. Now that we can recognize the error on our system, we need to reproduce the error so we can narrow down the problem. 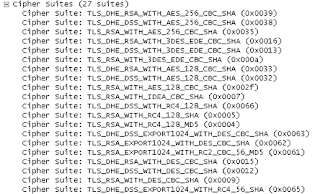 As you can see, it actually tries a TLSv1 connection which fails in the same way as the BizTalk one did, but then simply retries using SSLv3 which is successful. 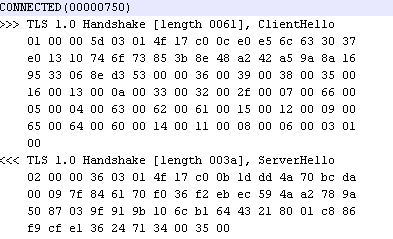 Wireshark shows exactly the same pattern as the BizTalk failed connection. If you toggle it to “https” on windows 2008(and presumably vista/7)it will try the initial handshake with TLSv1 and fail(note that SSLv2 is disabledin windows 2008 due to security concerns). 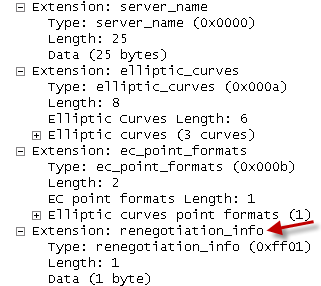 There does not seem to be a way to enable or set specific TLS extensionsfor the requestthough. TheRFC (http://www.ietf.org/rfc/rfc2246.txt)does not really shed any more light on the “unexpected message” error. 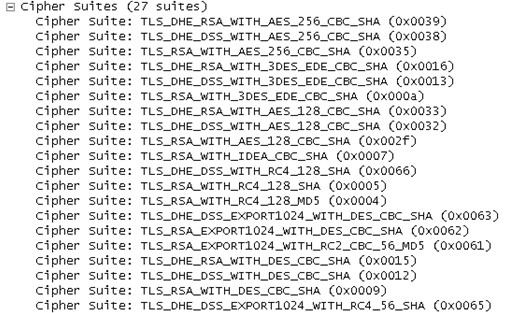 None of these suits ismentioned in the JSE6 documentationhttp://docs.oracle.com/javase/6/docs/technotes/guides/security/SunProviders.html#SupportedCipherSuitesbut it may be that there are functional aliases that should work. However, even if enabling renegotiation was the fix, itdoes not negate the inherent security risk in doing so in a production environment. However Webmethods does not support it so we can’t run it on a production system.Additionally it seems that Webmethods bypasses the default implementation anyway so it may not impact the error. 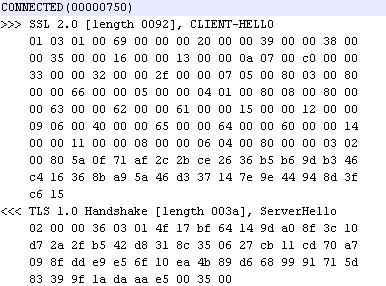 And added it to the classpath in the server.bat filein the hopes that it would contain a working cipher. No luck there. Although it would seem like the most logical step, installing a core patch for webmethods is also the most invasive solution which is why it is not at the top of our list. 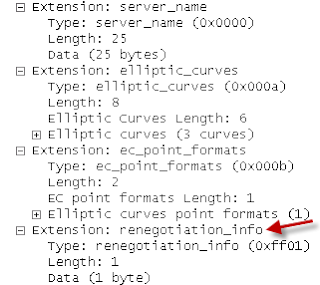 It actually points to a problemfor integration server 7.1.3 instead of 8.0.1, but it advises the installation of the latest core fix to solve the problem. 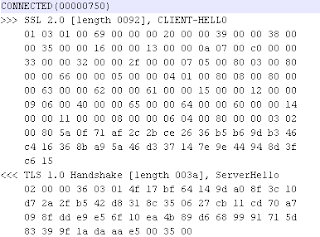 Installation of core fix 20 fixes the problem though we do still do not know exactly which part of the client handshake triggered the error. As a software aggregation method someone and ALM MVP I work in the implementation of Ag group Undergarment Computer, Visual Apartment and Microsoft curb Administrator. I'm answerable for delivery to customers turn their software case processes by right implementing microsoft software Group Foundation Computer tools in a real deportment that's matched for his or her system.